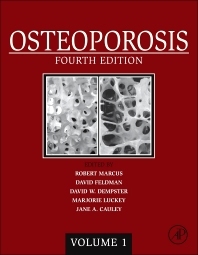 Now in its fourth edition, Osteoporosis is a classic reference on this disease, comprising a tremendous wealth of knowledge in a single source not found elsewhere. Written by renowned experts in the field, this two-volume work is a must-have for academic and medical libraries, physicians, researchers, and any company involved in osteoporosis research and development. This newest edition covers everything from basic anatomy and physiology to diagnosis, management and treatment in which direct care costs for osteoporotic fractures in the United States reach up to $18 billion each year. Worldwide, 200 million women ages 60 to 80 suffer from osteoporosis and have a lifetime risk of fracture between 30% and 40%, continuing to make osteoporosis a critical challenge in medicine. Coupling Factor – from Matrix or Cells? Is There a Single “Coupling Factor”, Analogous to RANKL? Oral Bone Loss and Systemic Osteopenia: are They Related? Chapter 65. Osteoporosis: Who Should be Treated? Who Should be Screened? How Well are Osteoporosis Treatment and Screening Guidelines Followed? Compliance and Persistence With Osteoporosis Medications: a Solution(s)? David W. Dempster, PhD, is Professor of Clinical Pathology and Cell Biology at Columbia University in New York. He obtained his PhD from the University of Glasgow in Scotland and completed postdoctoral studies in Switzerland and France. Dr. Dempster is a Past President of the International Society of Bone Morphometry and a member of the Scientific Advisory Council of the National Osteoporosis Foundation. He is also a Fellow of the Royal Microscopical Society. Dr. Dempster’s iconic micrographs of osteoporotic bone have been widely reproduced in the scientific and popular press, including being displayed at the Smithsonian Institution in Washington, DC. Dr. Dempster is an Associate Editor of Osteoporosis International, and serves on the editorial boards of the Journal of Bone and Mineral Research, Bone and the Journal of Clinical Densitometry. His research studies have been continuously supported by the National Institutes of Health for the past 25 years. Dr. Dempster has published over 200 research papers on the pathophysiology and treatment of bone disese. Dr. Cauley is Professor and Vice Chair for Research, Department of Epidemiology, Graduate School of Public Health, University of Pittsburgh (Pennsylvania). Her primary research interest is the epidemiology of osteoporosis, osteoporosis treatment and the consequences of osteoporosis in both men and women. She also has a major interest in menopause and the multiple physiological, social, pathological changes that occur during this time. Her research has focused on women's health and aging, falls, the interaction between endogenous and exogenous hormones, risk factors, inflammation, and disease outcomes. Her work has focused on use of hormone therapy, osteoporosis, risk of hip fractures and bone density in midlife women to older women. She is the Principal Investigator (PI) of several large cohort studies including the Study of Osteoporotic Fracture (SOF) and the Osteoporotic Fracture Risk in Men Study (MrOS). Results from both of these studies have made major improvements in our understanding of osteoporosis in older men and women. Dr. Cauley was Co-PI for the Women's Health Initiative (WHI) and served as study wide Chair of the Osteoporosis, Calcium and Vitamin D Committee for almost the entire duration of the trial. She is a Co-investigator for the Study of Women's Health Across the Nation (SWAN) with particular emphases on skeletal health and physical function and body composition changes as women transition from midlife to elder status. She is also a PI of a SWAN ancillary study examining novel measures of hip strength. She has participated as a clinical center PI for major randomized clinical trials including the Fracture Intervention Trial, the Multiple Outcomes of Raloxifene Evaluation, the Heart Estrogen/Progestin Study, the HORIZON Pivotal Fracture Trial and the Testosterone Trial. She has published over 570 original research articles.